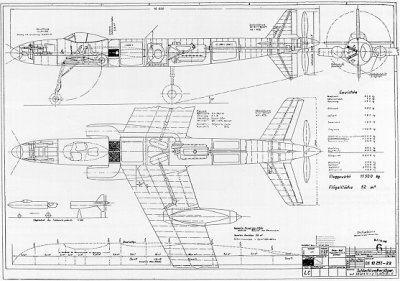 Engineers Schüffel and Merkel designed this mixed-propulsion aircraft as a night and all-weather fighter. 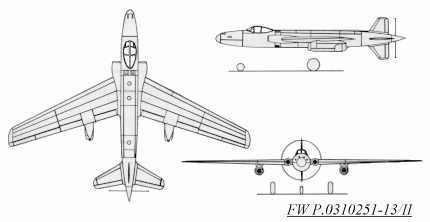 There were three different piston engines proposed for this project (see table below), with the latter two engine designs also featuring a pair of BMW 003A turbojets slung under the wings. The mid-fuselage mounted engine drove the rear propeller by an extension shaft and air was fed via two intakes in the wing roots. The wings were swept back and a cruciform tail was fitted, the lower fin also helping to keep the propeller from striking the ground during take off. A crew of three (pilot, navigator and radar operator) sat together in a pressurized cockpit beneath a bubble canopy. Flight times could be increased to eight hours with the jet engines shut down and the rear engine operating at half throttle. Weapons load was to be four forward firing MK 108 30mm cannon in the nose, but this could be altered to include two MK 103 30mm cannon and two MK 213 30mm cannon, or one MK 112 55mm cannon and two MK 108 30mm cannon. Two upward-firing oblique MK 108 30mm cannon could also be exchanged with the two MW 50 booster tanks. In addition, two 500 kg (1100 lbs) bombs could be included at the outer wing stations.